Edited and introduction by John Locke. Published by Off-Trail Publications, Elkhorn, California, 2011. J. Allan Dunn is a name familiar to any pulp collector who has thumbed through dealers' boxes of magazines—his name appears with some frequency on the covers of Adventure, Argosy, various Street & Smith publications, and Wild West Weekly. One S&S pulp fewer fans may be aware of is Outdoor Stories. Designed as a competitor for Adventure, it existed only for 13 issues. The three stories in this volume capture Dunn's appearances within this short-lived magazine. 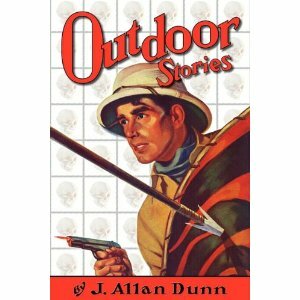 Each story displays Dunn's solid storytelling skills, and if one didn't know they appeared in Outdoor Stories, each could have appeared in Adventure without the reader knowing any different. The first tale, “The Lagoon at Mareva,” (January 1928) is perhaps weaker than the other two. It recounts the story of a young man gone out to the pearl fields to make his mark. He gets taken in by some no-good fellows who attempt to take advantage of his inexperience, but he sees justice done in the end. And he gets a girl, too. That glib description doesn't capture how well Dunn build atmosphere and weaves details from local color into the narrative, one of his particular strengths. The following two stories—“New Guinea Gold” (July 1928) and “Rama, the Rogue” (August 1928)—are superior to the first tale, perhaps because of their greater length, which allows Dunn to build characters and situations more carefully. The first recounts the adventures of two down-and-out Americans who get tied into a gold-hunting trek with an unreliable and underhanded explorer. Unfriendly tribes and far-from-civilized cultural encounters resolve into a rescue mission and a quest for bizarre vengeance. The inclusion of some coincidence worthy of Edgar Rice Burroughs is one deficiency for this story, but overall it's quite satisfying. “Rama, the Rogue” gives us an elephant hunt and characters and situations worthy of Talbot Mundy. A domesticated elephant—outlawed after killing its keeper—is the Rama of the title. That the keeper was deserving of his fate has no bearing on Rama's sentence, and he may be killed by anyone who encounters him in the wild, to which he has escaped. Dunn wonderfully describes the love and loyalty between Rama and his first trainer, who seeks to save Rama's life and redeem him before he can be destroyed. Dunn tells his story very well, and it wraps up pleasingly. John Locke has performed another fine publishing feat in compiling this volume. He provides an introduction to Dunn, a history of Outdoor Stories, and a nice profile of the magazine's editor. Locke's Off-Trail Publications again proves there are plenty of forgotten treasures to be found in the chipping rough-paper stacks of magazines published in the 1920 and before. Here's a nice report, lots of details, about PulpFest 2012 from a first-time attendee. Nicely done.